Essential to all life, water is the most important substance on Earth and yet it is so readily discarded. A recent study suggests that human activities pushing loss of liquid freshwater to an unsafe and unsustainable level. There are, however, measures that can be taken by chemists to use considerably less water. 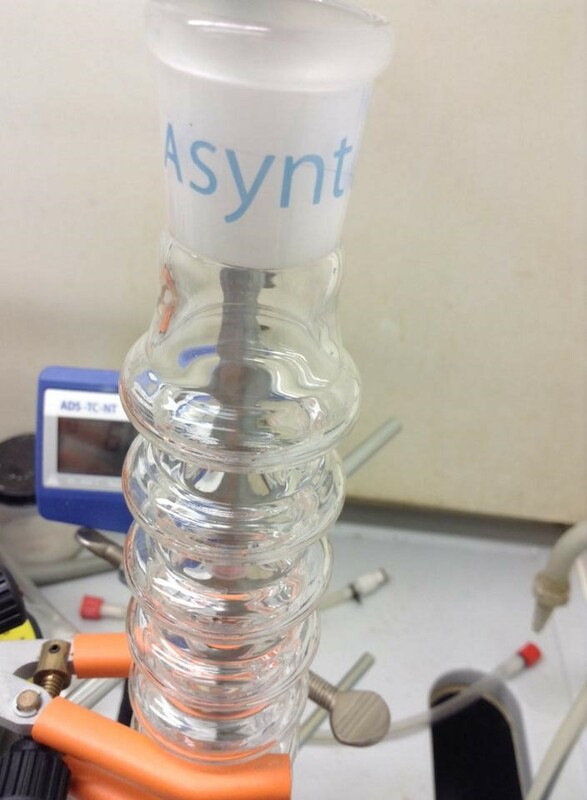 A traditional condenser is an integral piece of kit for any synthetic laboratory. While essential to synthesis, they are exceedingly wasteful. When left on for 6 hours, almost 350 L of water goes down the drain (based on an average across building 30). Throughout the building, enough water is used from these to fill over 200 baths per week! There are, however, alternatives that have been recently purchased by the department – they require no running water. The CondenSyn™ is a ribbed glass tube (see right) with a large internal surface area for condensation. The Findenser™ also has a large internal surface area, but also has a water cooled jacket with “fins” to increase air cooling (much like a car radiator). As part of an investigation into the new equipment, a reaction to synthesise a heterocyclic ligand was carried out using the waterless condensers ( CondenSyn™ and Findenser™ ) and comparing them to the traditional water condenser. They were heated to 70 degrees using a Methanol solvent. For this particular reaction, all three condensers worked well and gave no significant difference in the final outcome. 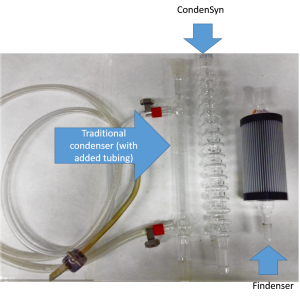 The two waterless condensers – especially CondenSyn™, were far easier to set up than the conventional one, with no need to fiddle around with tubing. Over the 7 hour reflux, the traditional condenser used over 500 L of water. 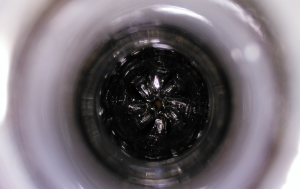 They’re not perfect – the Findenser™ is very heavy, which takes some getting used to; they’re not suited to all solvent systems either (although the majority of standard lab solvents are fine). Considering the vast water savings and their overall superior user-friendliness, they would make a great addition to a synthetic laboratory. We are distributing waterless condensers throughout the department and are keen for new groups to try them. 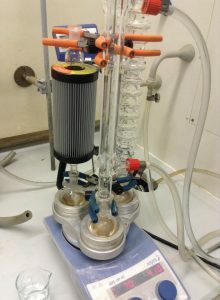 Dr Jon Kitchen’s group exclusively use these waterless condensers. Undergraduates use much higher amounts of water than researchers (I personally can vouch for this!). Dr Thomas Logothetis, teaching lab manager, is therefore introducing waterless alternatives into the undergraduate labs, aiming to “trigger behavioural change from the start of practical work central to chemistry”. © 2019 Chemistry SustainAbility Southampton.